It is easy while walking around Lichfield to pay attention to the timber-framed Tudor buildings and the Georgian and baroque buildings. But sometimes it is the curious and the unusual that catches my eye, that stops me in my tracks, and leads to uncovering interesting historical or literary associations. One of the curious and unusual houses on St John Street, for example, is Duart House at No 31, one of the many houses in Lichfield with associations with the family of the poet Philip Larkin. At first, this appears to be two houses, with a two-storey section set back from the rest of the street line, and a three-storey section that is flush with the rest of the buildings on this part of the street. Duart House is a Grade II listed building under the Planning (Listed Buildings and Conservation Areas) Act 1990 (List entry Number: 1218204), and was first listed in 1975. This house, which is now in divided into apartments, once had a number of offices, and had been a family home before that. The attractive front door is in the two-storey section, set back slightly from the street front, and the matching front windows at the ground floor level show how this was designed as one building. This is an early 19th century building. It has interesting stucco work and ashlar dressings, and a 20th century tile roof. It is built on a T-plan in a Georgian style, but I wonder whether the building includes part of an earlier structure on this site. It is two storeys, with a three-window range and with a three-storey, two-window, double-depth wing to the right. The first floor has a sill band. There is a top parapet, but a top frieze, cornice and blocking course to the wing, and there are coped gables. The segmental-headed entrance to the right end has an interesting doorcase with long brackets to the modillioned cornice. There is an over-light above the four-panel door. A segmental-headed window to the left end has a brick sill and a 4:16:4 pane horned sash window. A similar window to the wing has an ashlar sill and a 4:12:4 pane tripartite sash window, with panelled pilaster strips, and there is small segmental-headed window to the right end with a plate glass horned sash window. The first floor has windows with brick sills over the band and 12-pane horned sashes. The wing has windows with 12-pane sashes, while the second-floor window has four-pane sashes, although the lower glazing bars are missing. The wing has truncated lateral stacks. I am not sure where the name of Duart House originated, but the house was known as Duart House when Gilbert Warren Larkin (188-1939) died here on 14 August 1939. This branch of the family had also lived for many years at both No 7 and No 10 St John Street. Gilbert Larkin was a son of Councillor Herbert Larkin (1846-1924) of 7 St John Street, and was a first cousin of Sydney Larkin (1884-1948), who was born at 49 Tamworth Street, and was the father of the poet Philip Larkin (1922-1988). Gilbert Larkin’s son was Alfred Larkin (1922-1974), who was born in Lichfield on 29 December 1922. He was also living at Duart House in 1947 when he married Pauline Clements of 49 St John Street in Saint Michael’s Church on 7 June. The Lichfield Mercury reported on 13 June 1947 that the wedding reception was held in Duart House. Alfred Larkin worked in a tobacconist’s shop in Lichfield and died at 7 St John Street, Lichfield, on 7 August 1974. His widow Pauline died in 2001. 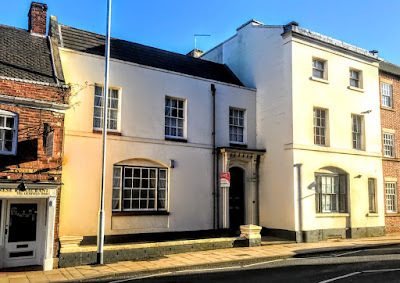 But for my search for Philip Larkin’s roots in Lichfield, I might have continued to pass this house, noticing its architectural curiosities and delights, but without asking questions about its place in Lichfield’s history.